Three into one does go with some picture postcards from the triple resort combination of Beverley Holidays... Under new management since 2014, Haw Wood Recently voted one of the top family holiday parks in Britain at the British Travel Awards 2017, the Beverley Hoidays group of holiday parks have been welcoming guests to the English Riviera’s sunny shores for 60 years this season. Now in its third generation of the Jeavons family, family run Beverley Holidays boasts an idyllic hilltop setting on the beautiful English Riviera in South Devon. 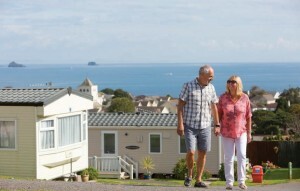 Visitors can choose from a wide range of accommodation from hot tub lodges and cosy holiday caravans, to dog-friendly caravans, touring caravan holidays and camping. The largest of three parks, Beverley Park, offers something for the family day and night including a show-stopping entertainment and tropical Oasis Leisure Club. An array of cafes, takeaways and restaurants offer something to suit all tastes, whether holiday makers are seeking a hearty meal of a quick snack on the go. Other facilities include an outdoor adventure playground and indoor soft play, plus an amusement centre, crazy golf course and outdoor and indoor heated pool where visitors can relax in the sauna, steam room, hot tub or gym or splash out at our pool parties. There is also a shop selling a wide range of holiday essentials and free WiFi in the main bar areas. For those in search of a slightly quieter base, Beverley Bay offers a relaxed holiday park setting with lighter-style facilities and its very own outdoor heated pool and Oceans Bar. Or, as a third option, visitors can spoil themselves with a stay in the exclusive setting of Beverley View, home to a stunning range of holiday lodges complete with outstanding sea aspects.